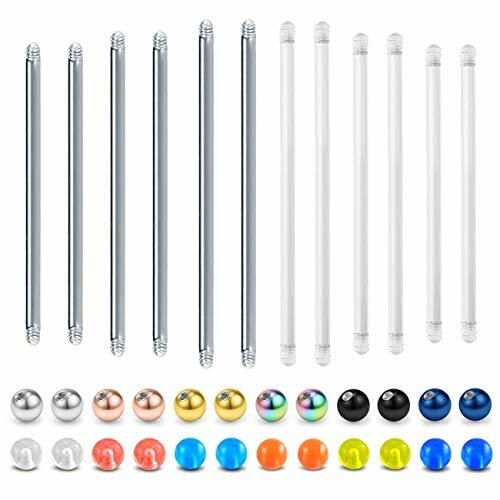 【Feature】 8 Pcs Industrial Piercing Barbell with a velet gift pouch Externally Threaded, easy to insert and take off, industrial barbell can be changed as you like 【Material】 316L Surgical Steel Bar hypo-allergenic, high Polished bar, good for those who are sensitive to other metals 【Size】 Barbell Size: 14 Gauge(1.6mm) Wearable Bar Length: 1 1/2" (38mm) Ball Size:5mm 【Care Tips for Your Jewelry:】 Avoid chemical reactions and be scratched When sleeping, swimming or bathing, the belly button should be removed from the exercise Small parts.Not suitable for children under 10 years old Due to the camera and the computer screen showing,the color will be a little different.Please kindly understand 【After-Sale】 *We committed to provide the best jewelry and offer the best services to you. *If you have any questions please don't hesitate to cantact us, we will reply within 24 hours. Description: Material is antiallergenic 316L surgical steel with satisfaction guarantee which is safe solution for surgery and 100% metal free. *Due to the camera and the computer screen showing,the color will be a little different.Please kindly understand. In order to let you have a happy shopping experience,we have done and will do as follows. 1.Products we sell are all in new condition and finished rigid inspection. 2.Pay attention to every details of products to give you a better wear experience. 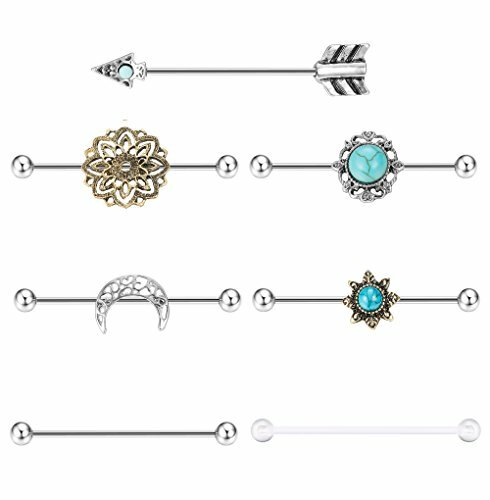 High Quality All the body jewelry made of hypoallergenic surgical steel, nickel and lead free,safe for sensitive skin. It has a smooth surface for a comfortable fit. 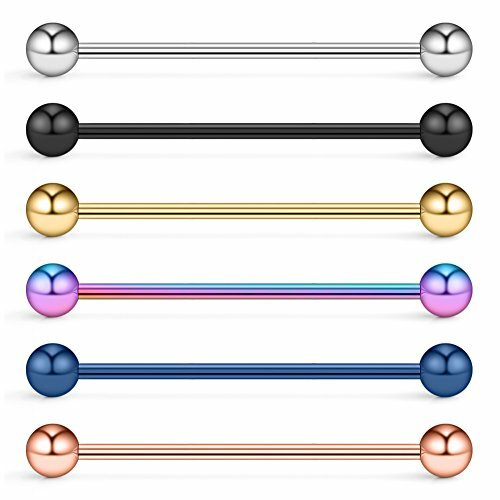 Specifications: Gauge Size: 14 gauge (1.6mm) Wearable length: 38mm(1 1/2Inch) Ball Diameter: 5mm, 6mm Material: surgical steel Colors: silver-tone, rose gold, rainbow, black, blue, gold-tone Quantity: 10 pieces Come with a black velvet pouch. About Dyknasz Best shopping experience is our main goal that we try our best to arrive all the time. Here at Dyknasz we offer a specialized customer service team that is available seven days a week to answer any product questions before, during or after the purchase. If you are not satisfied for any reason, you may return your unused item within 180 days of purchase. ORAZIO JEWELRY--Beautify Your Life Starting with A Fashion JewelryWe adhere to the "customer first" principle to provide our customers with products in high quality and fabulous shopping experience. What we offer are not only fancy products at an affordable price but also excellent customer service.ORAZIO 7PCS 14G Industrial Barbell Earrings for Women cartilage Conch Helix Piercing Jewelry:Industrial Barbell Set:7PCS Industrial Piercing Bar/Set,Silver Tone,Gold Tone,Rose Gold Tone are Available,More Choices for Daily Wearing.Stylish Style: Arrow Industrial Barbell,Industrial Bar with Ball,Industrial Piercing with CZ,7 Styles,Make You Different Everyday of the Week.About Service For a happy shopping experience, we have done and will continue to do as follows:1. Products we sell are all in new condition and have passed rigid inspection.2. If you have any questions, please feel free to contact us, and we will get back to you within 24 hours. 3. You will never worry about the issue of refund or return, because we promise 90-day warranty.Care Instructions Wearing the ring when taking a shower or going to bed is not recommended. Lcolyoli Jewelry:Good Choice Of Fashion Jewelry In Order To Let You Have A Happy Shopping Experience,We Have Done And Will Do As Follows. One By One Checking Make Sure Satisfactory Shopping And Wearing Experience. Products We Sell Are All In New Condition And Finished Rigid Inspection. Excellent Workmanship;Made With 316L Surgical Stainless Steel,Lead-Free Surgical Stainless Steel Won't Rust Or Stain With Sweat Or Water As Ordinary Steel Does, Hypoallergenic and Nickel Free, It Is Be Very Durable. 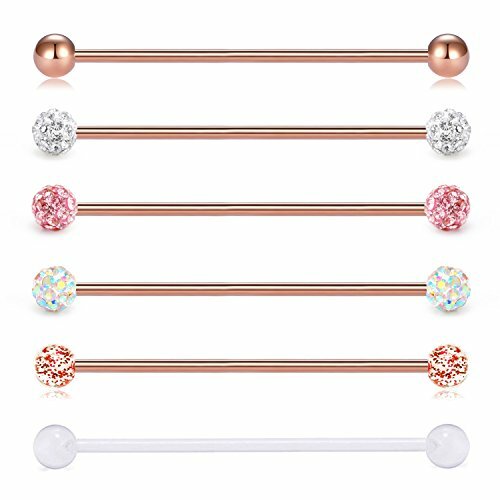 Specifications One Order Includes 9 Pieces Short Industrial Barbells in 3 Styles (Shiny Ball, Gilitter Ball and Champagne Crystal Ball). 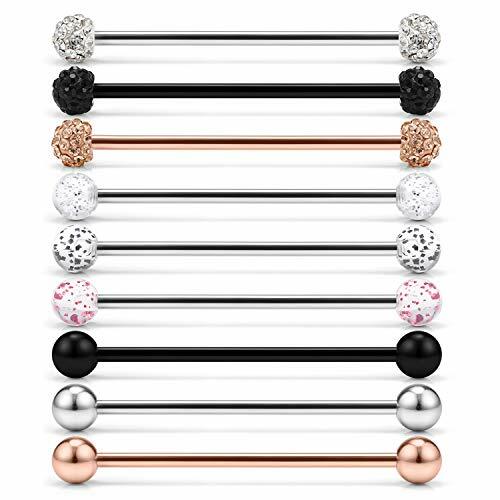 Staight Bar Thickness: 14G (1.6mm); Gilitter/Crystal/Ball Size: 5mm; Straight Bar Length: 32mm(1 1/4Inch); Color: Silver-tone, Black, Rainbow, Rose Gold. Suit For Women And Men. After-Sale Customer Service If You Have Any Questions Or Advice,Please Don't Hesitate To Contact Us, We Will Reply Within 24 Hours. Promise 90days Products Exchange Or Money Back Guarantee.Please Just Feel Free To Contact Us If You Have Any Problem. Package Packs Each Jewelry With A Velvet Gift Bag,Absolutely A Great Choice For Gifts That Anyone Would Enjoy Receiving,Especially For Yourself. Milacolato: The Solid Choice of Your Jewelry Product Description 1.7 PCS different style industrial barbell earrings a set, you could not miss such an economical and practical purchasing opportunity. 2.Moon Style, turquoise style, tribe flower style, acrylic industrial earrings.Various kinds for you to choose. You can wear one or several just as you want. Package Packs each jewelry with a velvet gift bag, absolutely a great choice for gifts that anyone would enjoy receiving, especially for yourself. After-sales Service and Warranty 1.We provide you 240 days guarantee-Promise 240-day Products Exchange or Money Back Guarantee. 2.If you have any questions after received the products, please contact us. We will reply within 24 hours. Care Tips for your Milacolato Jewelry 1.Store your jewelry in a clean and dry place separately or individually-wrapped in tissue to prevent scratches. 2.Please keep your jewelry away from chemicals, sweat, bath, crash to avoid any damage. 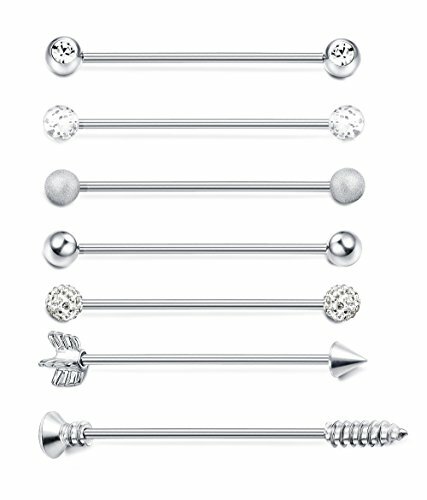 Want more Piercing Bar Barbell similar ideas? Try to explore these searches: Marshall Usb, Hyde Park Oil, and Elura Digital Battery.